« A TASTY CARROT OR A NASTY STICK? 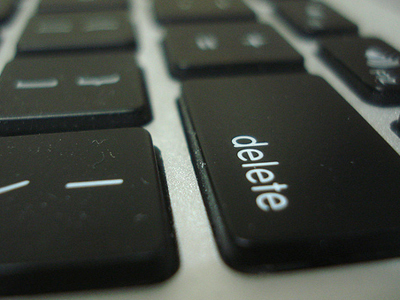 I think all us email users can agree on this: often, there is no better button on our keyboard than ‘delete’. “Earn your degree while you earn a living!” DELETE. “Browse local Asian singles near you!” DELETE. “Prepare for a job in law enforcement!” DELETE. “Don’t pay your next cable bill without reading this!” DELETE. As we go through this routine, it occurs to me that most of us probably wish we could whack a delete key on some things that we’ve done and said. Or things we should have done & said, but didn’t. I’d love to erase the hurtful things I’ve said to my wife. I wish I could delete those times I’ve cut off other drivers. I’d sure like to wipe out all those negative thoughts I’ve had about my abilities. I wish I could delete those times when I’ve reacted hastily without getting all the facts. Wouldn’t it be great to erase that dumb thing I did at work last week? For people like me, who’ve decided to follow Jesus Christ (whom serious Christians believe is the Son of God), there’s a great thing to know and make a part of our lives: God’s favourite button is also DELETE. The mistakes I’ve made? Gone. Those times I should have said something helpful to a co-worker, but simply walked away silent? Wiped out. That relationship that went sour because of me? Eliminated. How about you? The contractor you paid under the table to avoid taxes? It could be gone. Those nasty things you’ve thought or said about your relative? They could be wiped out. How far can this go? If you believe in a creator who cares about everything that goes on in our lives, then all the way to something this trivial: all the occasions when I carelessly deposited perfectly recyclable things into the garbage? Deleted. One of those people is me. And it could be YOU, too. I looooooove having God see me, with all my glow-in-the-dark imperfections, just as He sees His son: perfect, without a single blemish. It empowers me to do better, to try to live up to how God sees me – even as I know that when I fall short, He hits the DELETE key, because, as Adrian put it, I “belong to Jesus”. What do you think…does this make sense? Post a comment below and let’s have a conversation. It makes perfect sense! So thankful Jesus’ paid the price for my sins once and forever. Great post, Frank! It’s funny Frank, I’m not sure why but I had a moment yesterday when I felt like this. Wishing I had the delete key for things I’ve said and done. Some of it more than 20 years ago. Glad God forgives easier than I do. God has deleted half of my life, so many mistakes. The only good things that came of them was that they taught me something along the way. They taught me that I needed Jesus in my life more than anything else this world could provide. Thanks for the post. Your interpretation of the lesson makes perfect sense. Unfortunately, the lesson itself is standard propaganda to make the idea of faith attractive. The Prodigal Son, which is a similar parable, is possibly the worst kind of lesson you can teach anyone. Go ahead, make a bunch of mistakes but just remember to repent and then God will say it’s OK. Done something wrong? Feel bad about it? Good. That’s called “Having a conscience”. You hopefully won’t do it again, because you’ve learned from it. Don’t DELETE it though. Those mistakes make you who you are. You may want to run from that, you may want to bury it, they may be from a time you’ve moved on from, but they’re still your history. So take them with you. Don’t be defined by those moments, but don’t erase them as if they never happened.They’ve made you the person you are, for better or worse. >I’d love to erase the hurtful things I’ve said to my wife. Sorry, you can’t. Your wife has got a memory. She can forgive you though which is far better than you pretending they never happened. >The contractor you payed under the table to avoid taxes? Why should I expect God to delete that? Why shouldn’t I confess to this? Wouldn’t it be great to burn all those history books about the Holocaust and the Second World War? Just delete them? Forget they happened? NO. Because we learn from them. Because if we don’t remember, we’re doomed to make the same mistakes again. Same principle. Don’t delete. Remember who you were, the mistake you made and learn from it. >I looooooove having God see me, with all my glow-in-the-dark imperfections, just as He sees His son: perfect, without a single blemish. It empowers me to do better, to try to live up to how God sees me – even as I know that when I fall short, He hits the DELETE key, because, as Adrian puts it, I “belong to Jesus”. You’ve contradicted yourself. Does God look at you and see you as he sees his son, or does he have to delete things to see you as he sees his son? If God truly loves you, he shouldn’t need to delete anything. He made you, after all. Pete, I’m not for a moment suggesting WE delete our mistakes. And others don’t necessarily delete our errors, either. It’s not in our very imperfect natures. Finally, I’m not for a moment suggesting there isn’t a penalty to be paid *in this life* for the wrong things we’ve done and the right things we’ve failed to do. What I am saying, however, is GOD deletes them after we accept and believe in the Christ’s sacrifice. And if we’re serious about doing that, then we welcome God’s Holy Spirit into our lives to begin the long and usually arduous process of making us more like Christ. And part of that process is learning from our mistakes.